Our enterprise is in the league of prominent firms providing a wide gamut of Ishihara Test Book. Popular and efficient test for red/green colour vision deficiency, our test book is specially printed to measure incrementally higher color sensitivity. The offered test book is specially printed to measure incrementally higher color sensitivity and specificity. Moreover, this test book can also be customized as per the several requirements of our customers. Book is specially printed to measure incrementally higher color sensitivity and specificity. In order to accomplish the specific demands of clients, our organization has come up with a huge gamut of Vision Testing Chart that has multi language option. 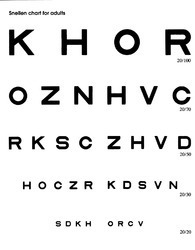 The offered testing chart can be easily mounted on the wall & widely demanded for eye testing. Also, our testing chart is checked from our side before supplying to customer’s end. This testing chart is available with us in diverse sizes and other specifications to meet the specific requirements of customers. Our organization is actively devoted towards offering a wide gamut of Vision Testing Chart / Visual Acuity Chart. Our offered testing chart is adaptable to smaller rooms with precise adjustment of distance. The provided testing chart is accessible from us on several sizes & other specifications as per the variegated demand of clientele. As well, these testing charts have external USB Port for easy software upgradation. External 3.5mm audio jack for audio output. Exclusive Image gallery for various eye diseases. Catchy remote control with direct commands for all tests. Packaging Details: Packed in safe corrugated box. We are noted as the trusted manufacturer, exporter, importer, trader and supplier of an extensive and premium quality Ishihara Book that quickly differentiates between congenital and acquired defects. This ishihara book is recognized internationally as highly reliable method of determining color deficiency. 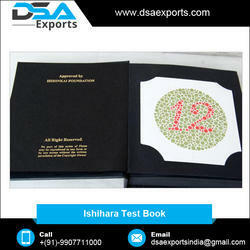 Our offered ishihara book is specially printed to measure incrementally higher color sensitivity and specificity. Also, this ishihara book is checked in terms of quality before dispatching from our end. 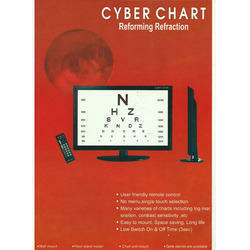 Looking for Vision Testing Charts ?